This is why the cost of living expenses matters. How much you need to save for retirement depends on where you live. 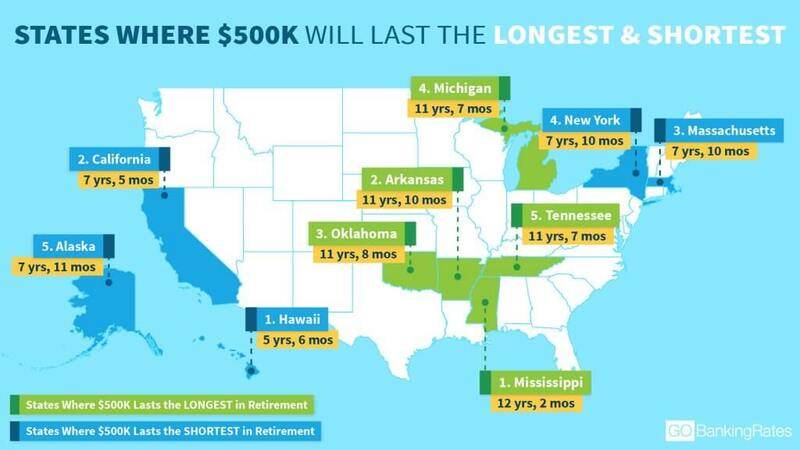 To find out how long $500,000 will last in retirement in every state, GOBankingRates analyzed the average spending data for people ages 65 and older as well as the cost of living in each state. I live in Texas (No. 11 ranking), where $500,000 saved will buy me 11 years of retirement. I jump-started my retirement savings starting at age 22. So, if I can average a 7 percent return and maintain my savings rate through the remainder of my 30-year career horizon, I will only need to maintain contributions of about $147 a month to hit this financial milestone. However, you might need to save more if you live in a pricier area. Learn exactly how much you need to survive retirement in your state. According to GOBankingRates’ analysis, $500,000 will fund more than 12 years of your retirement in only one state: Mississippi. For all the states in the top 10, however, those savings will last more than 11 years. If you live in any of these places, you could be living in a retirement planner’s financial paradise. In fact, many of the cheapest places to retire are in the South. Remember that you can offset higher costs of living by choosing to retire later, reducing annual expenses or relocating to a lower cost-of-living state in the twilight of your career. Click through to find out how long $1 million in retirement will last in every state. Methodology: To find out how long $500,000 will last across the country, GOBankingRates analyzed the average spending data for people 65 and older as well as the cost of living in all 50 U.S. states. GOBankingRates found the mean annual expenditure for every state by observing the cost of living, annual groceries, annual housing, annual utilities, annual transportation and annual healthcare. Once this data was gathered, GOBankingRates took each category’s index score divided by 100 and multiplied that by the mean national expenditure for people 65 and older in order to find the annual cost for each given category. Sources used in this study include the Bureau of Labor Statistics and the Missouri Economic Research and Information Center. It's a perfect storm of rising prices and falling incomes.